I recently shared a post about a wonderful lunch I attended at Hanna Winery as part of the 2017 Wine Bloggers Conference. During the course of that lunch, it became very clear that owner Christine Hanna is interested in wine pairings and cuisine almost as much as she is in wine. We attendees were even gifted a copy of her cookbook The Winemaker Cooks: Menus, Parties, and Pairings. It is full of elegant yet simple recipes that are organized into seasonally appropriate menus. Along the way, she offers wine recommendations for each recipe, as well as insights, info, and wine tips throughout the book. As soon as I saw the book, I was excited to dive in and cook from it. Moreover, I was really interested to chat with her about her winery, experiences, and of course, wine pairing. (Check out my email conversation with Christine here.) 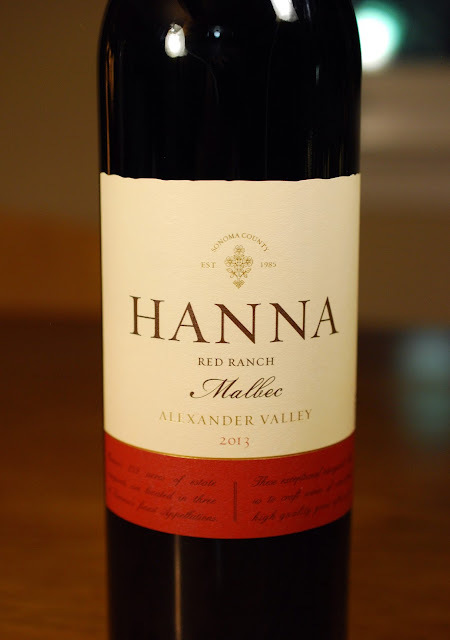 Hanna actually only has about 10 acres of Malbec total, and makes 600 cases of their Flagship version, and 300 cases of their Reserve. Before we all sat down to eat lunch that day, we had a chance to taste some barrel samples of upcoming releases. I was intrigued by their Malbec, not the least because you still don’t see a ton of it in California. According to Christine and Jeff Hinchliffe, the winemaker at Hanna, this has at least partly to do with Malbec’s tendency to shatter (aka coulure)–essentially this is when grape clusters fail to develop into maturity. (Check out this article on VinePair if you’d like to know more. If the grapes don’t grow, the yields on plantings will be lower than ideal. Since I was tasting it from the barrel, the wine was still a bit rough around the edges. Nonetheless, it had a lot of dark fruit notes that were rich, but nonetheless, very bright. There were plenty of tannins, but even at that stage they were starting to smooth out. I decided to buy a bottle of an earlier vintage to bring home. In the lead up to this post, I asked Chris to make a recommendation on a pairing from her book. 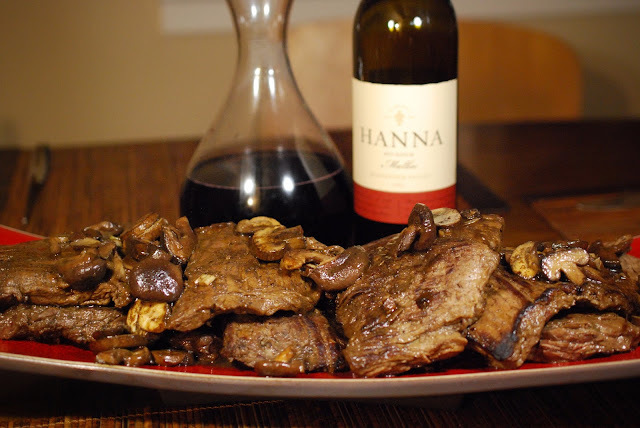 Chris suggested her recipe for Pan-Seared Hanger Steak with Porcini-Merlot Reduction as a good match for the Hanna Malbec Alexander Valley Red Ranch 2013 (SRP $34). This seemed perfect to me–Malbec and steak are such a classic combo. I followed the recipe pretty closely to how it is written in the book, with a couple of small adaptations. 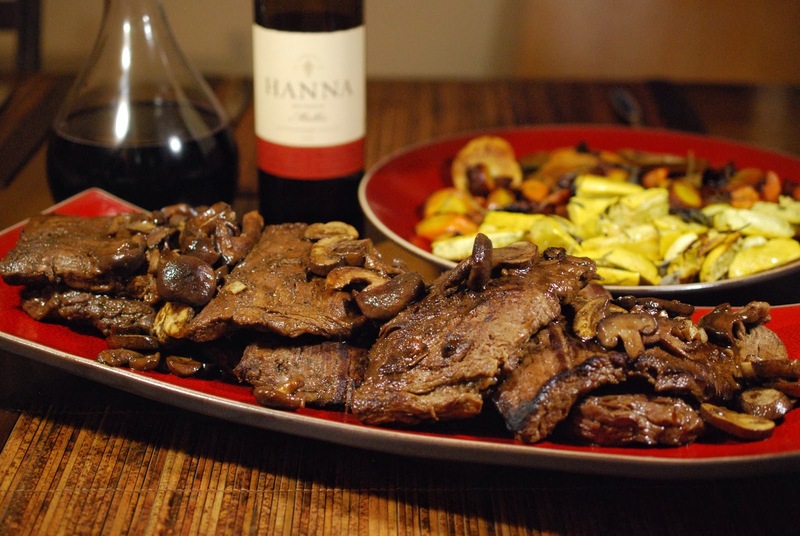 My local grocery store was all out of porcini mushrooms and hanger steaks, so I swapped in shiitakes (recommended as an alternative in the book anyways) and skirt steak instead. The hanger and skirt cuts actually both come from the diaphragm of the cow, but the skirt steak is a little less flavorful and a little tougher. Given that, I decided to tenderize the meat a bit by pounding it with a meat mallet (always a great way to get out stress), and then let it spend some time in a simple marinade. If you’d like to make the recipe as prepared in the book, simply use hanger steak and skip step one; just remember to salt and pepper the steak. To make it easier to serve for a party without getting stuck in the kitchen the entire time, I did everything (mostly) ahead of time through the mushroom prep in step 3 below. When we were about ready to eat, I reheated the mushrooms and returned the steaks to the pan for the final 2 ½ minutes per side, working in batches. Alongside the steak I served roasted veggies–carrots, yellow squash, and potatoes–individually roasted at 425°F with a little olive oil, salt, pepper, herbs, and a little squeeze of lemon on the carrots and squash to finish things off. I also served some sautéed collard green with garlic and topped with bacon. The combo was a crowd-pleaser. One friend commented, ‘I can’t pick it apart, but they do go really well together.’ I’ll go ahead and pick the wine apart a bit. The wine had all that rich fruit I recalled–lots of boysenberry, blackberry, and raspberries–with light hints of licorice spice, pepper, smooth tannins, and that bright streak of acidity I had found so appealing. (Note: Hanna is out of the 2013 Malbec tasted, but do currently have a very few cases of the Reserve 2014 Malbec. The 2015 Flagship is available as well. In the book, Christine recommends Cabernet Sauvignon to pair with this dish–which makes sense as Cab and steaks are also a classic combination. Since we were a large group, one bottle of wine with dinner was not going to be enough, so we had a chance to try a few more wines with the steak. Among them was a Cab and a really rich Merlot, both from California, and both definitely also went really well. However, what I particularly liked about this Malbec was that while it had plenty of rich, ripe fruit and enough body to match the weight of the steak, it also had a streak of orange peel freshness that was really uplifting to the palate and kept it all from feeling heavy. Adapted from The Winemaker Cooks by Christine Hanna. Serves 6. 1. Lay out the skirt steaks on a cutting board and pound with a meat mallet to tenderize. Place the steaks in a bowl and top the Worcestershire sauce, shiitake mushroom powder, and sprinkle pinch of salt and pepper. Rub the mixture into the steaks and allow them to marinate for at least an hour. 2. In a large, heavy sauté pan or frying pan, heat the oil until medium-high heat until shimmering. Remove the steaks from the marinade and pat dry if necessary. Working in batches if necessary, add to the steaks to pan and sear in the hot oil until browned, about 2 minutes per side. Transfer to plate. 3. Add the mushrooms to the pan and return to medium-high heat. Add the garlic and stir to combine. Add half the wine, deglaze the pan, making sure to scrape up any browned bit of meat. Cook the mushrooms for 2 to 3 minutes. Add the remaining wine and the beef stock. Return the steaks to the pan, cover and cook for 2 ½ minutes on each side for medium-rare. Add salt and pepper to taste. 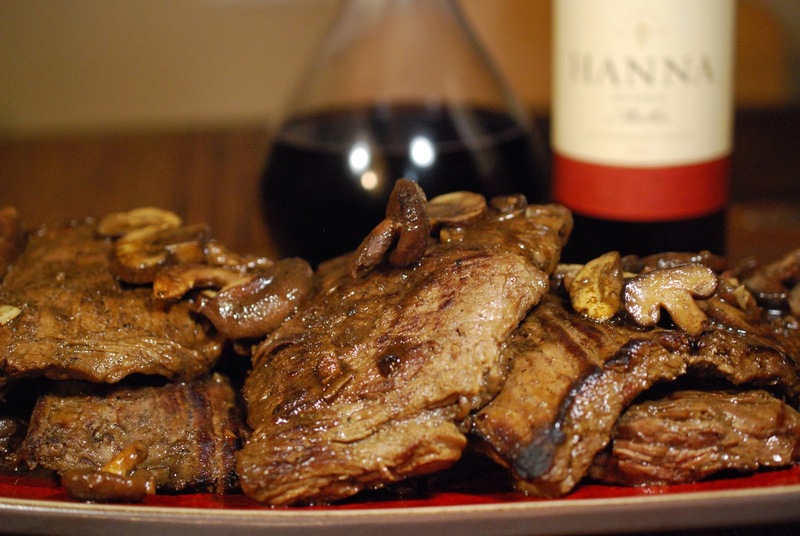 Serve the steaks drizzled with the pan sauce and mushrooms. This month the Wine Pairing Weekend Crew is celebrating women winery owners and winemakers. We’ll be discussing our discoveries on Twitter on Sat. Feb. 10. Join us by following the hashtag #WinePW between 11-12 EST / 8-9am PST. David from Cooking Chat brings us > Tuscan Kale Pasta with Elisabetta's Vernaccia. Gwendolyn from Wine Predator explains > We're with WALT: owner Kathryn Hall, Winemaker Megan Gunderson Paredes. Lauren at The Swirling Dervish is running with the wolves for > Donnachiara Montefalcione - Five Generations of Wine, Wolves, and Women in Campania. For another beautiful California wine from a female winemaker right here on SommsTable.com, check out Cooking to the Wine: Bouchaine Rock'n H Vineyard Sonoma Coast Pinot Noir with Blackened Five-spice Duck. Great pairing! Looking forward to reading your interview with Christine and learning more about her wines. And perhaps another pairing? Cheers Nicole! I had had the Hanna Sauv. Blanc at the wine bloggers conference. and it was so good. I stopped at their smaller tasting room in Santa Rosa before heading back to the airport. I still have a bottle of the SB to try as well. And I'm hoping to make it to the Santa Rosa tasting room sometime soon -- I hear it's under renovation. Sounds like a perfect way to end the trip though. Just ordered the book! Thanks for the recommendation. And that dish looks amazing. Oh so cool! Happy cooking Camila! Sounds like a great pairing! I'm going to have to check out the book. Haven't had California Malbec that I can recall, so curious about it.